We’d love your help. Let us know what’s wrong with this preview of The Kitchen Boy by Robert Alexander. Drawing from decades of work, travel, and research in Russia, Robert Alexander re-creates the tragic, perennially fascinating story of the final days of Nicholas and Alexandra as seen through the eyes of the Romanovs' young kitchen boy, Leonka. Now an ancient Russian immigrant, Leonka claims to be the last living witness to the Romanovs' brutal murders and sets down the da Drawing from decades of work, travel, and research in Russia, Robert Alexander re-creates the tragic, perennially fascinating story of the final days of Nicholas and Alexandra as seen through the eyes of the Romanovs' young kitchen boy, Leonka. Now an ancient Russian immigrant, Leonka claims to be the last living witness to the Romanovs' brutal murders and sets down the dark secrets of his past with the imperial family. Does he hold the key to the many questions surrounding the family's murder? Historically vivid and compelling, The Kitchen Boy is also a touching portrait of a loving family that was in many ways similar, yet so different, from any other. To ask other readers questions about The Kitchen Boy, please sign up. Is this a. Clean book could a young teen read this? Tom Darrow Depends on the teen. The language is easy enough for a teenager to comprehend, although it jumps back and forth between Russian phrases and their…moreDepends on the teen. The language is easy enough for a teenager to comprehend, although it jumps back and forth between Russian phrases and their English translations, which might confuse some. On the subject of content, the murder scene is somewhat graphic, although not graphic just for the sake of being graphic. Also, there are a few things that the guards do to the bodies (particularly the female ones) that parents might object to. Hey, I wrote it, what am I supposed to say but I love it! aaaand my massive binge read on all russian related books continues. я ни о чем не жалею! if i hadnt already known before picking this up that it was a work of historical fiction, i would have never assumed that. not in a million years. i was blown away at how much of this read like a memoir. the story felt so personal and so realistically genuine. yes, the events that happened were unfortunately real, but wow. i believed nearly every single word of this book! and if that isnt a testament to the aaaand my massive binge read on all russian related books continues. я ни о чем не жалею! if i hadnt already known before picking this up that it was a work of historical fiction, i would have never assumed that. not in a million years. i was blown away at how much of this read like a memoir. the story felt so personal and so realistically genuine. yes, the events that happened were unfortunately real, but wow. i believed nearly every single word of this book! and if that isnt a testament to the phenomenal quality of this story (not to mention the research done to ensure its accuracy), then i dont know what is. i found this to be quite moving, highly informational, and truly a gem of a book on what was otherwise a terribly dark moment in history. very well done! What follows is a long account of how the kitchen boy, Leonka, was present in the house as the ladies sewed large numbers of diamonds into the corsets of the four daughters of the tsar. He describes his friendship with the young tsarevich Alexis, his interactions with the rest of the family and what he heard and saw on the fatal night of their murders in the cellar of the house on 17th July, 1918. Does the man who now calls himself Mikhael Semyonov know what happened to the two bodies that were never found? Is he the key to the solution of a century old mystery? Why does he reveal the story now? Many years ago, in my high school world history class, I was assigned a research project. I cannot recall how or why I ended up with Rasputin being my research topic, but he became the subject of my project. It was then and there that my strong interest in the Romanov story was born. Ever since, I have been fascinated by the Romanov family and this tumultuous piece of history. And for anyone interested in the tragic tale of the Romanovs, The Kitchen Boy, is a fantastic read. This novel, by Robert Alexander, is a fine piece of historical fiction. Told from the perspective of Leonka, a kitchen boy, working in the house where the Romanovs were imprisoned, this novel explores the last few weeks of the Romanov’s lives. Robert Alexander does an excellent job with the entire setting and feeling of this book. It feels very personal and poignant, and the flow of this novel is astounding. Although we all know what ultimately happens to the Romanov family, the build up along the way is full of tension, anxiety, and fear. There is a heaviness that accompanies this story. Not only that, there are deeper mysteries lurking throughout this novel. Connecting present with past, truths and lies and confessions come pouring out, giving the reader a very interesting mystery to piece together. I must say, I thought by the end I had it all figured out, but I did not! The last several pages had me completely on edge. For the first 170 pages, I felt like the Alexander was beating a dead horse by focusing on the same four points over and over again. 1)Leonka was the kitchen boy, 2)Although Tsar and Tsaritsa had many failings, they were good people that deeply loved their family and Russia, 3) The conditions the Romanovs were kept in were terrible with little hope of escape, and 4)Misha hated himself for how history unfolded. Seriously, I was sick of these points being described again and again. Yet, I didn't s For the first 170 pages, I felt like the Alexander was beating a dead horse by focusing on the same four points over and over again. 1)Leonka was the kitchen boy, 2)Although Tsar and Tsaritsa had many failings, they were good people that deeply loved their family and Russia, 3) The conditions the Romanovs were kept in were terrible with little hope of escape, and 4)Misha hated himself for how history unfolded. Seriously, I was sick of these points being described again and again. Yet, I didn't skip a single sentence. I think that's because Alexander would unfold them in a slightly different angel every time. So... I guess I liked Alexander’s writing style. By the way, this was our Book Club's March book. Many of my friends had finished the book before I did. They kept telling me how the end had a twist and how they were still thinking about the ending. I thought, “How could this book have a cool twist for an ending?” The book was so straight forward and dull with description that I knew I could predict the ending. So, I thought of the most wild and strangest endings I could think of—just in case it was a really crazy twist. I am not going to appear smart at my Book Club on Thursday. I was NO WHERE close to guessing the ending!!! The last seventy pages, WOW! I couldn't read fast enough! There were so many twists and turns. And that's how I came to give this book three stars. Like all well-educated individuals, I first learned about the Romanovs from the animated movie Anastasia. I know you remember it. Don't deny it. You Want a Little Sass with that Romance? You Betcha! I am still a kid at heart and still adore this movie for everything that it is (I fear that "accurate" is not something that it is). Unfortunately, this means that my obsession interest was based on LIES. Being aware Like all well-educated individuals, I first learned about the Romanovs from the animated movie Anastasia. I know you remember it. Don't deny it. I am still a kid at heart and still adore this movie for everything that it is (I fear that "accurate" is not something that it is). Unfortunately, this means that my obsession interest was based on LIES. Being aware of this, I decided to approach The Kitchen Boy as a newborn babe - unaware, innocent, and wrinkly yet adorable. You know what I loved about this book? Well, a lot of things, but the first was that it didn't go on and on and on and on (much like this review may end up doing). It was short and precise but also very powerful. There is a mystery/twist, but I was a little oblivious and didn't get caught up in that at all. Much of the book was the day to day activities of the Romanov family and the select servants still with them, but it didn't feel repetitive. Even the mundane "rinse, lather, repeat" days fascinated me. The mystery/twist was just a bonus. I loved that the way the characters were presented made me grow attached to them. Good Because: I felt connected to the characters. I felt like I was there. A fly on the wall. I felt my heart break for that poor Tsar and Tsarista because they weren't evil; they were just oblivious and ignorant and too wrapped up in their own family and four walls. And while I don't love feeling sad (ok, sometimes I do), I do love a book that can make me feel. Bad Because: I just dreaded what I knew was going to happen all the more. I went to bed right before that part of the book because I knew I wouldn't be able to sleep if I read it then. I loved that there was Russian throughout. It made me want to learn Russian, and I was walking around my house repeating words in an incredibly horrific amazing Russian accent/imitation. I felt so fancy! ...the indented passages, select notes, and letters attributed to the Romanovs, their captors, and Rasputin are all accurate and can be found in various archives. This helped me separate the fiction from the non-fiction. Sometimes a girl needs a little help. Next time I will just pick up a non-fiction book and save myself the headache. Still a great book and a great story. Aqui está um livro completo! Não tenho nada a apontar, já que gostei de tudo nele. O tema - a história trágica dos últimos dias da família Romanov, a forma como nos é contada, com um narrador fabuloso que me agarrou da primeira à última letra, a escolha de uma forma possível do desfecho deste episódio trágico muito bem construída e ainda uma surpresa no final. Perfeito! Cansei-me aqui e ali de algumas repetições, embora as compreenda, uma vez que quase toda a história é contada, na primeira pessoa, por um homem já muito velho, e devem ser assim, às vezes erráticas, às vezes repetitivas, as recordações de um homem perto do fim e consumido pelo arrependimento. Ainda que se trate de uma ficção, tem como base factos comprovados e com testemunhos materiais, peolo que creio que fiquei a saber um pouco mais sobre os Romanov (sabia pouquísimo). Para Na verdade, são 4,5. 3.5 stars. If like me, you know very little about the Romanov's, this is an excellent introduction. The author explains, while blending it in as part of the story, the politics and history. He also shows that bad rulers, can still be good people. And to top it off he manages to still add a lot of suspense to a story where everyone knows the ending. I was assigned this book for school; my Ma hadn't read it, just bought it offline. It went with our last year's study of Russia, and the Romanov family. Granted, of course, we learned plenty and read books on the time line, learned about Russia, saw the anger and the mobs during that bad time, etc. But no book brought to life just how tragic and serious that time of history was like this fictional novel. Not for me. I was never interested much in the history of Russia. I'd started reading the L I was assigned this book for school; my Ma hadn't read it, just bought it offline. It went with our last year's study of Russia, and the Romanov family. Granted, of course, we learned plenty and read books on the time line, learned about Russia, saw the anger and the mobs during that bad time, etc. I was never interested much in the history of Russia. I'd started reading the Last Tsar, and found that obviously the history was absolutely awful. An entire royal family being murdered in the same room, with their servants and their dog, too; I couldn't imagine that graphic, that horrific kind of thing. This book is from the fiction perspective of the 'kitchen boy'- he lives with the Romanov family while they're 'under lock down' (basically, that's what happened). Honestly, I can't give much of this story away because it's just... so stunning and astonishingly told. The story leads you on. Not slowly, nor so fast you lose track of what's happening. I loved how it was told, the style of writing. It wasn't some far-fetched, extravagant tale- no. It was told in a serious, startling tone. That time of history was crucial- and it was told as such. It wasn't on a whim; the story and the perspective it was told from was all very keen. The only thing that bummed me with this book, was the fact there seemed to be no hope. If there was, it was crushed and found as a lie. I didn't particularity like that- with the kitchen boy's end... I feel that he didn't have to end like that. With no hope. Perhaps the author (and the world) found what ended and how the boy's thoughts were in his final time more 'realistic' or something... But I don't. As the story is told, yes, the narrator did some very, very bad things. But I was forced to think as I read: would God forgive him? If the man asked for forgiveness for what he had done, would Yeshua have forgiven him? I do not know if the author was a Christian or such; but that ending, that part, I found wrong. Hope, faith, it IS there. We are not lost cases. Not with God. God was in no part of this book, so I didn't quite expect for hope to be found in the story: but I wish it had. I think that if faith in God had been a part of the narrators heart: it would have been different for him. Because he did not, I felt deeply sorry for him. It was that gripping and moving of a book, in a way; though I wrestled in distaste because no hope was present, I still saw the character's utter lost self. It showed me what we really are without God, when we face our sins and past alone. Without mercy, without His Love. This book is still one of the best I think I've read. It was a fascinating, heart wrenching story. The history itself has lessons to teach, and to see it written out in such a story really made it all the more vivid. O Leonka, o nosso narrador é brilhante. Descreve acontecimentos com uma emoção e carinho fora de série. Nem parece que a ação se passa numa casa com uma família e alguns criados como prisioneiros e os seus guardas. Está muito bem ficcionado e tem ali 2 plot twists finais fantásticos. Que me levaram a dar-lhe a pontuação máxima. A hemofilia está muito bem explicada. Quem não percebe nada de hereditariedade consegue perfeitamente perceber como se transmite a doença. De salie Que livro espetacular! De salientar que o autor não recorreu a um chiché bastante conhecido sobre o fim dos Romanov o que também me agradou bastante. I am demoting this book to two stars because after stewing for a couple of months, I've decided it annoys me. The Kitchen Boy is not bad. The language of the narration is interesting. There is a stilted, halting, slightly awkward flow to the language which reminds me of how my husband (who lived in Russia until his mid-20s) would write in English. I'm not sure if Robert Alexander (a native English speaker) wrote like this on purpose or not. But in general I'm not very impressed with the style. I I am demoting this book to two stars because after stewing for a couple of months, I've decided it annoys me. I've generally avoided reading fictional accounts of the Romanovs generally because there is so much documentation on who they were and what happened to them - and their story is so outrageous, sickening, and heartbreaking - that fiction just seems unnecessary. And there's a lot of EXTREMELY well-written nonfiction books on the subject. Just read Robert Massie's Nicholas and Alexandra, for god's sake. Most of the book is confessional-style - the narrator (the kitchen boy) is spilling his guts to a tape recorder. There is a fairly predictable twist at the end and I don't really buy some of the reasoning that the characters made justifying the secrecy. Tantas vezes procurei este livro na biblioteca, mas estava sempre indisponível. Finalmente apanhei-o e, oh, fantástico! Este livro foi realmente algo! Eu sabia que realmente ainda havia algo por descobrir! É uma leitura dolorosa, mas aquele epílogo foi realmente bom. Factos misturados com a imaginação nem sempre correm bem, no entanto, acho que resultaram neste livro. Há quem ache que possa ser demasiado o final escolhido pelo autor, mesmo que seja, esta lufada de esperança foi realmente saborosa Tantas vezes procurei este livro na biblioteca, mas estava sempre indisponível. Finalmente apanhei-o e, oh, fantástico! É uma leitura dolorosa, mas aquele epílogo foi realmente bom. Factos misturados com a imaginação nem sempre correm bem, no entanto, acho que resultaram neste livro. Há quem ache que possa ser demasiado o final escolhido pelo autor, mesmo que seja, esta lufada de esperança foi realmente saborosa no fim. 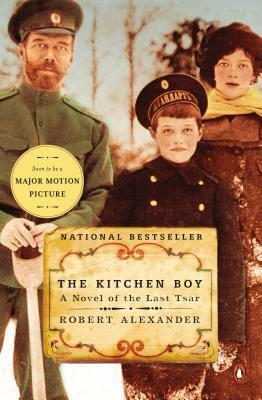 Robert Alexander’s The Kitchen Boy is a fictionalized account of the Romanovs’ last days. Several historical records mention a kitchen boy working for Tsar Nicholas and Tsarina Alexandra during their captivity in Yekaterinburg. These references inspired the novel. Misha is the kitchen boy. In the late 1990s, he lives in the United States and has recently lost his wife. Before dying himself, he makes a tape for his granddaughter, explaining exactly what happened to the Romanovs on the days precedi Robert Alexander’s The Kitchen Boy is a fictionalized account of the Romanovs’ last days. Several historical records mention a kitchen boy working for Tsar Nicholas and Tsarina Alexandra during their captivity in Yekaterinburg. These references inspired the novel. Misha is the kitchen boy. In the late 1990s, he lives in the United States and has recently lost his wife. Before dying himself, he makes a tape for his granddaughter, explaining exactly what happened to the Romanovs on the days preceding and immediately following their murders. I was fascinated by the account, particularly since most of my background on the topic comes directly from the animated feature Anastasia. Alexander humanizes the royal family but also holds them accountable for much of Russia’s recent history. Indeed, Misha suggests if the royal family had acted differently, had been more in tune with the country, they could have prevented Stalin’s eventual reign of terror and spared the lives of millions. Despite their heavy historical responsibility, despite knowing their fates, I irrationally hoped the family, particularly the children, would escape and was horrified by the manner of their deaths. The women had hidden jewels in their corsets. When the firing squad shot at the princesses, the bullets ricocheted off the gems, prolonging their deaths. I'm excited to be sharing this book with a new book club. Yes, I enjoyed it that much. "The Kitchen Boy" relata os últimos dias dos Romanov, a última família imperial russa. A elevada classificação deve-se, em grande parte, ao meu gigante fascínio pela cultura russa, nomeadamente pelo tempo dos czares, com carinho especial para Nicolau II, devido à sua trágica história. Contudo, em tal classificação, também tive em conta a brilhante escrita de Alexander e a sua soberba capacidade para, a partir de relatos verídicos e cruéis, ter construído uma história de grande interesse e sobre a qual posso dizer que gostei. Sim, é verdade: apesar de tão minuciosa e cruel descrição do assassínio, suficiente para me deixar horrorizada, consigo dizer que GOSTEI REALMENTE IMENSO DESTE LIVRO; apesar de ter acompanhado, ao longo das páginas, a triste e sufocante prisão domiciliária dos Romanov, os seus últimos dias, e de ter 'presenciado' a crueldade (mais uma vez repito, mas este adjetivo é mesmo o mais adequado para descrever o horror descrito nas páginas do assassinato desta família) da sua morte e a maneira como foram tratados (antes e depois disso), gostei bastante do livro. Não por Robert ter amenizado o sofrimento das personagens, nem por ter colorido os acontecimentos. Não, ele não o fez... Limitou-se a narrar de forma nua e crua e ligeiramente impiedosa... Não... O que ele fez foi abordar a verdade de maneira totalmente diferente da que estávamos à espera: quando parecia que nada nos podia surpreender, que enfim tínhamos descoberto e percebido tudo, eis que descobrimos que não sabíamos nada! :P e recebemos a revelação como um enorme balde de água fria que nos penetra e marca. Excellent historical novel about the final days of the last Tsar of Russia and his family. A plot that makes you want to keep reading, with a great twist at the end. The simplistic writing style seems to be the norm for historical-fiction nowadays and maybe it's to ensure the writing doesn't get in the way of the premise but the impact can be construed as patronising at times. Anyway, I am scooting through this and am just at the point where Nicholas reads The Protocols of the Elders of Zion, which he considers useful, and the point is made that he never gets to realise that it was a hoax of colossal obnoxiousness. Another thought that could be worth discuss The simplistic writing style seems to be the norm for historical-fiction nowadays and maybe it's to ensure the writing doesn't get in the way of the premise but the impact can be construed as patronising at times. Anyway, I am scooting through this and am just at the point where Nicholas reads The Protocols of the Elders of Zion, which he considers useful, and the point is made that he never gets to realise that it was a hoax of colossal obnoxiousness. Another thought that could be worth discussion about mindsets - it is interesting to know who read what during captivity, a great issue was/is made of Hitler's prison reading list. "My name is Mikhail Semyonov. I live in Lake Forest village, Illinois state, the United States of America. I am ninety-four years old. I was born in Russia before the revolution. I was born in Tula province and my name then was not Mikhail or even Misha, as I am known here in America. No, my real name - the one given to me at birth - was Leonid Sednyov, and I was known as Leonka. Please forgive my years of lies, but now I tell you the truth. What I wish to confess is that I was the kitchen boy in the Ipatiev House where the Tsar and Tsaritsa, Nikolai and Aleksandra, were imprisoned. This was in Siberia. And ... and the night they were executed I was sent away. They sent me away, but I snuck back, and that night, the moonless night of July 16-17, 1918, I saw the Tsar and his family come down the back twenty-three steps of the Ipatiev House, I saw them go into that cellar room ... and I saw them shot. Trust me, believe me, when I say this: I am the last living witness and I alone know what happened that awful night ... just as I alone know where the bodies of the two missing children are to be found. You see, I took care of them with my own hands." As some of you know we haven't that long ago visited St. Putinsburg, so of course we visited the Winter Palace Hermitage Museum and stood where the last Tsar and his family were kept confined for so long before being taken off to their ultimate stay upon their last journey. As always, standing where some momentous 'space' in history occured, it made us shiver at the cruelty and blinkeredness of humankind. Now as I understand it, this book was ordered by me because somewhere it was going to be book of the month and it has taken so long to arrive that I have probably missed all the action and discussion; nevermind, I shall still read with avid interest, another rendition of this sad tale. It isn't clear to me what exactly the author of this book was hoping to accomplish when he wrote "The Kitchen Boy". When starting it, I'd been under the impression that it was a ficion in some shape or form, but almost the whole way through I felt like I was reading a documentary on the Romanov family- a compilation of facts (some quite randome) and events that I already knew. And so I decided that Mr. Alexander's goal in writing this book, was merely to educate those who cared to know on the om It isn't clear to me what exactly the author of this book was hoping to accomplish when he wrote "The Kitchen Boy". When starting it, I'd been under the impression that it was a ficion in some shape or form, but almost the whole way through I felt like I was reading a documentary on the Romanov family- a compilation of facts (some quite randome) and events that I already knew. And so I decided that Mr. Alexander's goal in writing this book, was merely to educate those who cared to know on the omanov's last days in the Ipiev House, their murder, and multiple burials. This conclusion satisfied me for a while, until brief moments of fictional creativity appeared here and there, upsetting the hystorical accuracy I'd lulled myself into expecting. It just didn't flow. It wasn't until the very end of the book (The last chapter and the Epilogue, actually) that I really felt like I was reading a work of fiction and felt any real interest in the book, because it isn't until the end that the fictional twist is revealed and explained. If Robert Alexander's goal in writing "The Kitchen Boy" was to document the last days of the Romanov family, he would have met that goal very nicely if he hadn't confused history with his random, fictional twist thrown in as an afterthought to conclude the documentary. If his goal was to take a well-known historical tragedy and turn it into an intriguing, believable work of fiction, he failed miserably by making his readers suffer through 20 or so chapters of unnecisary historical facts before getting to his plot (which only lasts about one chapter). I think that the idea of his fictional twist was great! If it had been handled differently, it had the potential to be a great historical fiction! This review has been hidden because it contains spoilers. To view it, click here. Told from the point of view of an elderly "kitchen boy" recording a history of the last days of the Romanovs, the writing style of this book was a little stilted. The facts, while interesting, didn't read as a smooth narrative, but rather a dry recitation. I give the author credit for making Nicholas and Alexandra sympathetic, but not forgetting to include their flaws. The ending just about ruined the book for me. Though I had pretty much guessed the "big secret" from early on - I just c Told from the point of view of an elderly "kitchen boy" recording a history of the last days of the Romanovs, the writing style of this book was a little stilted. The facts, while interesting, didn't read as a smooth narrative, but rather a dry recitation. I give the author credit for making Nicholas and Alexandra sympathetic, but not forgetting to include their flaws. Although I understand it's supposed to be fiction, some historical inaccuracies bothered me too much to give this book a full five stars. That being said, I immensely enjoyed it. Also, the plot twist at the end? Just, what? Totally did not see that one coming. It's pretty much how you wish the story had gone. The Romanovs have fascinated me for years, and it was interesting to see Alexander's take on their last months of captivity. Narrated by Leonka, the kitchen boy, this is the story - part fact, part fiction - of the Romanovs last month. Using some of their real-life letters, notes and diary entries, and with storytelling that incorporates both haunting factual detail and suspenseful dramatic fiction, it’s a desperately sad but equally fascinating page turner. A riveting read. One of my FAVOURITE books of ALL times!!!!!!!!!!! I recommend it! “You see, my love. As you've always said, after the rain-"